Many voters are focused on the presidential candidates Hillary Clinton and Donald Trump, but they are not the only individuals who will be on the ballot Nov. 8. There are four Haslett School Board candidates and only three open seats. The candidates and residents gathered at the Haslett administration building for a board candidate forum. 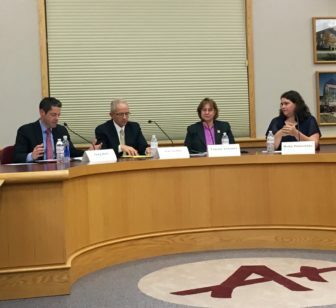 Each candidate said they would make a great addition to the board for the next six years. Wayne State University Director of State Relations candidate Greg Bird said he wants to be more involved in the Haslett community. “I want to be sure that all students in our district have a great experience,” Bird said. Bird said his extensive experience and knowledge of education policy and budgets qualify him to hold a seat on the Haslett School Board. Candidate Tammy Lemmer is the sitting secretary on the board and has experience in the district. “I think I bring a sense of continuity and leadership and experience to the board,” Lemmer said. Michigan State University outreach specialist in the Department of Family medicine candidate Molly Polverento says she is running because she cannot think of a more important way to serve the community and schools. “Running for this board is very personal. I’m the daughter, cousin and niece of teachers in this district; we were always thought the importance of school and our teachers,” Polverento said. Haslett School District substitute teacher candidate Tim Griffin wants to take his knowledge of and experience with the schools to the next level. “I’m in a unique position, being a stay-at-home dad, to interact with teachers, staff and administrators during avilable school hours whenever there is such need,” Griffin said. Wilkshire kindergarten teacher Shannon Murton came to the forum to learn more about the candidates, who could join the board in the near future. She said she is looking for someone who is accessible and willing to listen to all aspects of the community. She wants someone who understands that it is about the kids and not just money. After hearing what each candidate had to say Murton is still undecided. “If I was to vote today I wouldn’t know, but I thought they all did a really nice job and I want to know more about them,” Murton said. Treasure Roberts is majoring in journalism and media & information at Michigan State University. She plans to graduate in 2018 and jump right into the news industry. Treasure has had multiple internships during her time at MSU. She was a reporter at The State News and HOMTV. She was an intern writer for White Hills Lakes magazine and a communications intern at Life Oasis Church. Treasure is a member of Delta Sigma Theta Sorority Inc., and the chapter journalist. In addition, she holds the position of historian in the National Pan-Hellenic Council. She is very passionate about journalism and believes that with strong will, hard work and dedication she can reach her ultimate career goals.